Thank you for reading my blog! I am Wendy Tietz, PhD, CPA, CMA, CSCA, CGMA. I am also a Fundamentals of Sustainability Accounting (FSA) credential holder. I am a professor of accounting at Kent State University in Kent, Ohio, where I have taught introductory accounting classes for more than 16 years. I teach in a variety of formats, including large sections and online sections. My teaching focus and passion is introductory financial and managerial accounting at the undergraduate level. This blog is intended to provide a concise resource for real life news stories to use in teaching introductory accounting. Both financial and managerial accounting stories are provided. These blog postings are brief and the content can easily be used in both a face to face classroom and in an online environment in a variety of ways. 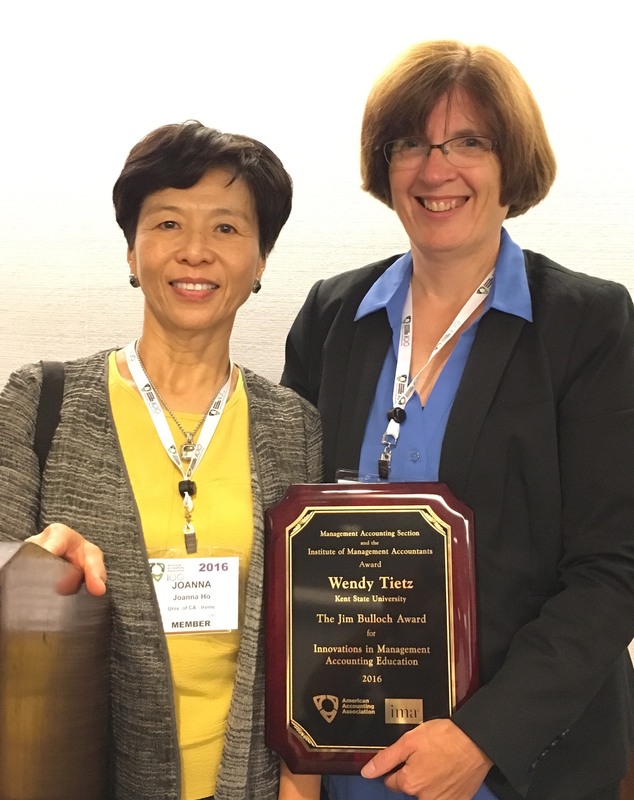 I was the recipient of the Bea Sanders/AICPA Innovation in Teaching award in 2014 for this blog and the Jim Bulloch Award for Innovations in Management Accounting Education award in 2016. I also received the Bea Sanders/AICPA Innovation in Teaching award in 2017 for the Accounting Case Template tool that I developed. I do speak at many events about my blog. In the past few years, I have presented at the Texas Society of CPAs Accounting Education Conference, the Virginia Society of CPAs Educators’ Symposium, the West Virginia Council of Accounting Educators’ Conference, the Conference on Teaching and Learning Accounting (CTLA), the American Accounting Association Annual Meeting, and others. Please reach out to me if you are interested in having me present at your accounting education event. I am also the co-author of two introductory accounting textbooks: Managerial Accounting, Braun & Tietz, 5th edition, 2017, Pearson Education, and Financial Accounting, Thomas, Tietz & Harrison, 12th edition, 2018, Pearson Education. Please reach out to me with any comments or feedback. You can reach me via email at wtietz@kent.edu, wendytietz on Instagram, @wendytietz on Twitter, or on my Facebook page. This is an awesome idea that you are executing well! I am glad you shared it with me at PHASE. Thanks for the feedback; glad it is useful! I’m never disappointed about what I learn of others from The Last Word in the Journal of Accountancy each month. Learning about your blog and now seeing what you have created here is just great. A very enjoyable way to learn…even for a CPA – thank you! Read about this site in the JofA. Wendy, you are a terrific teacher! I read through a couple of the cases and I find that you ask questions that force students to think and analyze the situation. I am looking to start teaching as a second career in a few years time; for now, I have found another channel to further my own education! I read about this in JoFA and thought it was a great idea too. Thanks for sharing. You should look up DoD fair or audit readiness. We are undergoing probably the largest most complex audit. Just read The Last Word and found your blog. I am teaching at a community college, Managerial Accounting this summer, and have already printed the Best Buy ROI impact handout to use as an engagement activity for the next chapter I am presenting, Financial Analysis. This is wonderful work! I will refer them to Yahoo finance to find the financial statements. I love your site! I am new to teaching and I really think this site will help me introduce and explain the topics to my students. I am always searching for very informative information like this. This is exactly what I was looking for. Thanks for sharing this great article. Thanks much. I enjoyed meeting you! It looks like your have done a lot of work on a very good idea. Cases are frequently too involved even for upper level courses. Using shorter news items sounds like a more effective way to mix some real world examples into accounting education. I placed some links to your blog on several pages of the MAAW site. James: Thank you for linking to my blog in your resource (which looks like a rich resource itself.) Have a great day! Thanks so much – glad you find it useful.